Jupyter Notebook and its flexible interface extends the notebook beyond code to visualization, multimedia, collaboration, and more. Of course, it’s much more complex, because it has to deal with multi-line code, tab completion using readline, magic commands, and so on. But the model is like code example: prompt the user for some code, and when they’ve entered it, execute it in the same process. This model is often called a REPL, or Read-Eval-Print-Loop. All the other interfaces —- the Notebook, the Qt console, ipython console in the terminal, and third party interfaces —- use the IPython Kernel. 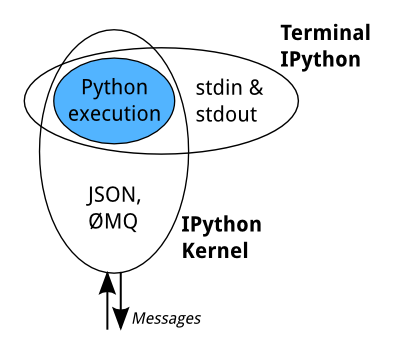 The IPython Kernel is a separate process which is responsible for running user code, and things like computing possible completions. Frontends, like the notebook or the Qt console, communicate with the IPython Kernel using JSON messages sent over ZeroMQ sockets; the protocol used between the frontends and the IPython Kernel is described in Messaging in Jupyter. 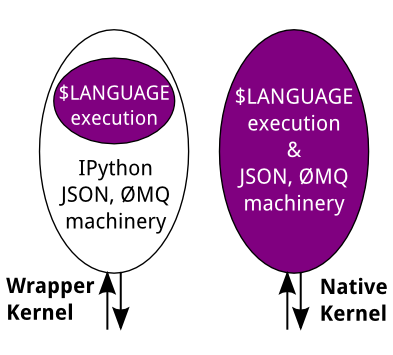 A kernel process can be connected to more than one frontend simultaneously. In this case, the different frontends will have access to the same variables. This design was intended to allow easy development of different frontends based on the same kernel, but it also made it possible to support new languages in the same frontends, by developing kernels in those languages, and we are refining IPython to make that more practical. Wrapper kernels are easier to write quickly for languages that have good Python wrappers, like octave_kernel, or languages where it’s impractical to implement the communications machinery, like bash_kernel. Native kernels are likely to be better maintained by the community using them, like IJulia or IHaskell. The Notebook frontend does something extra. In addition to running your code, it stores code and output, together with markdown notes, in an editable document called a notebook. When you save it, this is sent from your browser to the notebook server, which saves it on disk as a JSON file with a .ipynb extension. 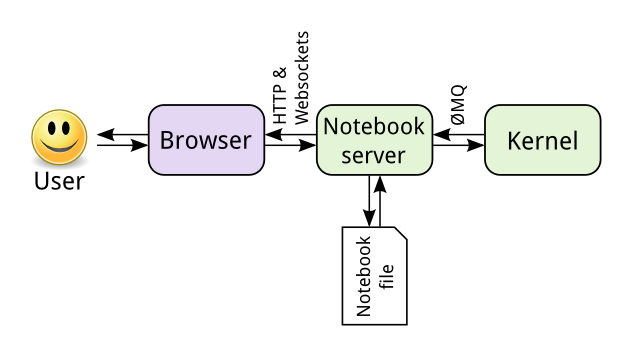 The notebook server, not the kernel, is responsible for saving and loading notebooks, so you can edit notebooks even if you don’t have the kernel for that language—you just won’t be able to run code. The kernel doesn’t know anything about the notebook document: it just gets sent cells of code to execute when the user runs them. Preprocessors modify the notebook in memory. E.g. ExecutePreprocessor runs the code in the notebook and updates the output. An exporter converts the notebook to another file format. Most of the exporters use templates for this. 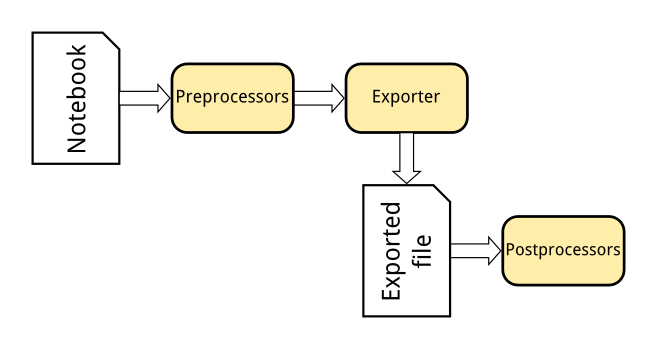 Postprocessors work on the file produced by exporting. The nbviewer website uses nbconvert with the HTML exporter. When you give it a URL, it fetches the notebook from that URL, converts it to HTML, and serves that HTML to you. IPython also includes a parallel computing framework, IPython.parallel. This allows you to control many individual engines, which are an extended version of the IPython kernel described above.